Our town just celebrated “Old Home Days” – other towns call it Pioneer Day; Settler’s Day – where the old stories are told and lives well lived remembered. Towns across America will be celebrating their heritage this summer and newspapers will be interviewing the “old timers”. 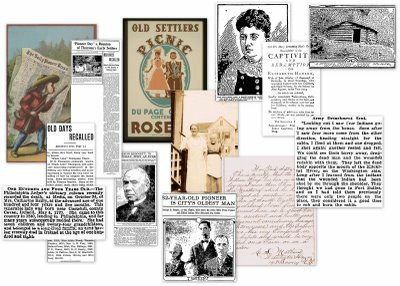 Newspapers are a good source for finding the interesting stories of what life was like when they settled in the area; their first job; the flood; the war; the successes and all of the other milestones in their lives. Discover your heritage, preserve it and pass it on! Be a part of GenealogyBank – Sign up Now. GenealogyBank – the best source for old newspapers on the planet. Many of the families I am researching came West on the Oregon Trail. Good to know John Brassfield. Have you documented their experience? Did their journals, letters survive? Were there articles in the old newspapers with accounts of their trip West – or of others making the same journey? It would be great to see what their experiences were – or of others – so you can get a sense of what that trip was actually like.